A nutritious diet starts with choosing healthy ingredients, and the supermarket is the place where most of us get our food. Everything you need for balanced nutrition, from fresh fruit and veggies, to whole grains, lean protein and dairy can be found there. It’s just a matter of picking out the right mix for your individual health needs. How do you go about shopping for healthy food? This guide will show you how. There is plenty of information out there to help us meet our nutritional needs. A good place to start is with MyPlate (www.choosemyplate.gov). Here you can read about the key elements in a healthy diet, get a personalized daily food plan and check out how your diet measures up. There are also specific articles about nutrition for specific groups such as preschoolers and kids, pregnant and lactating women, and diets for weight loss. You can also find sample menus and special guides for eating out and vegetarian diets. These materials will help guide you in the supermarket to the most nutritious foods for you. The “Nutrition Facts” panel on foods is the way to go to navigate through the range of wares available and select the right product. It lists the nutrients that most of us need to know about when we are selecting foods for our shopping cart. All labels report total calories per serving, as well as fat, carbohydrate, protein, cholesterol and sodium levels. Dietary fiber is a nutrient that many of us need to eat more of, and that is listed as part of the carbohydrates. It is also a good idea to limit foods high in saturated fat, cholesterol, and sodium. In addition, the amount of iron, calcium, vitamin A and vitamin D as a percentage of the average diet is also listed. You may find more vitamins and minerals listed, and this information can also help you to make an informed choice. Many foods nowadays have extra nutrients added either because they are lacking in diets, or to help out individuals who have special nutritional needs. For example, folic acid is a vitamin that is crucial for pregnant and lactating women, but they may not be meeting the recommendations. Foods that are fortified with folic acid or folate help them to get enough every day. People at risk of cardiovascular disease may benefit from plant sterols, which have been clinically proven to reduce blood cholesterol levels. These foods provide a means for everyone to get the nutrition that they need. 4) Mix it up: variety! Healthy diets are varied diets. The best way to make sure you are eating a balanced diet is to choose a wide array of foods. Particularly with fruit and vegetables, it is important to eat a rainbow of colors from dark green, to orange, red and purple. 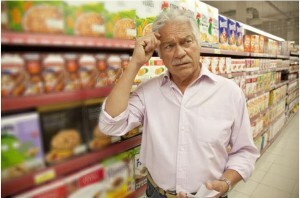 Your supermarket provides a wide array of fresh, canned and frozen vegetables that all form part of a nutritious diet. Varying protein and carbohydrate sources provides endless dietary diversity that makes mealtimes fun. Nutrition guidelines change as new research comes in. Stay abreast of the latest nutritional news via trustworthy organization like the American Dietetic Association (www.eatright.org/public) and the Food and Nutrition Information Center (fnic.nal.usda.gov). These organizations provide a wealth of nutrition information that will help you when you are shopping for groceries.